Since we learned about the introduction of the 24″ Chase Hawk tire from Odyssey, the anticipation surrounding them seemed to be sky high. We endured teaser pictures on the OTX social media accounts, and waited patiently for them to arrive. Thankfully,the 24″ Chase Hawk tires are now out and available. The question is…do the 24″ Chase Hawk tires live up to the hype? Buddy Sardenga in Austin, Texas picked up a set to see. Well, the first thing that I noticed about the tires are how quiet, fast, and grippy they are. I did like the Stolen Joint tires* but l could not run my front brake through the fork, they hit the cable. 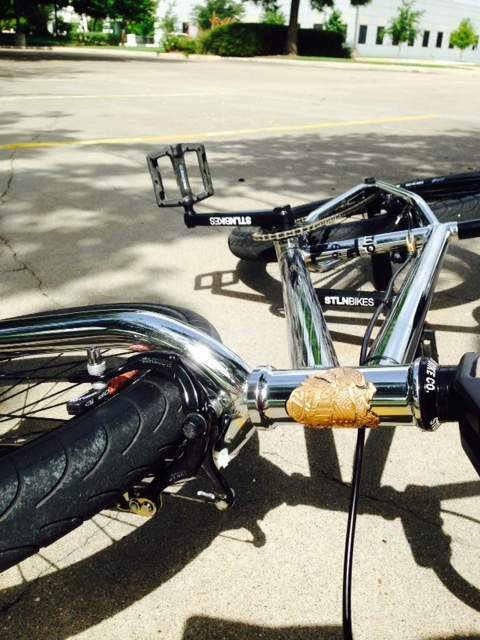 *Buddy’s currently riding a chrome Stolen Saint XLT. I ran [Tioga] Powerblocks for a bit since they came in 2.1 and were very cheap at 17 bucks…but they are very slow on concrete. The Chase tires are a 2.2 [yet still] about the same size as the Powerblocks… but super fast and grip way better. So, how do they measure up riding street, park and dirt? The tire is more of a slick for park and street and I was concerned about dirt riding with them. I guess they did their research on that because I had no issues on the dirt. Those little groves that come from the side provide very good traction even if things are not very well groomed. Looks like the 24″ Chase Hawk tires do live up to the hype. I think Buddy’s final thought on the tires sums it up best. If you ride a 24, check them out for sure. It appears Odyssey’s got a winner on their hands with the 24″ Chase Hawk tires. Sometimes vendors have to make the tough call when it comes to what bikes and parts to display at Interbike. Whether it’s logistics, space issues or something else, sometimes bikes and components that you were kinda hoping to see aren’t on display. Here are some of the bikes that I wished were on display at Interbike, based on the catalogs that I saved from the show. The next is the SE Quadangle Freestyle 24. If you recall, we checked out a sneak peek of this bike back in June. I had my fingers crossed that I would be able to check it out in Vegas. No such luck. 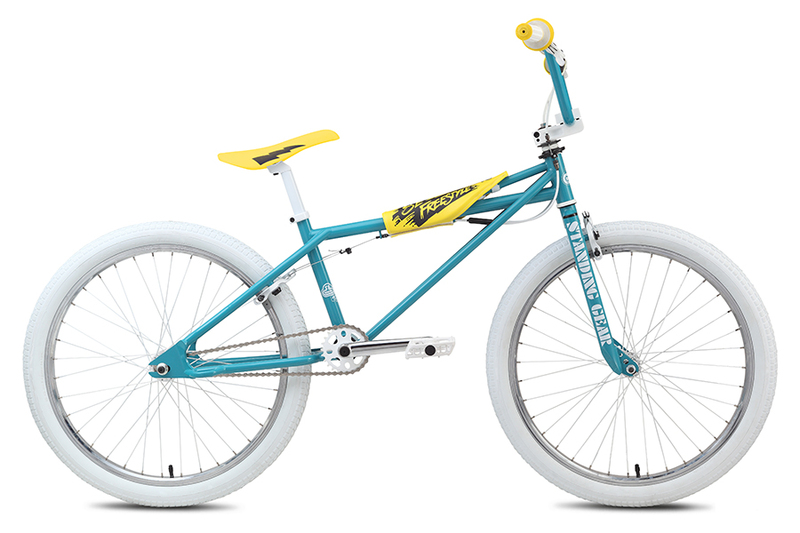 Still digging this bike though…old school looks with new school geo…would love to try one of these bad boys out! Definitely some cool looking rides! It’s September and that means, in addition to the classic Earth, Wind & Fire song, “September” constantly playing in my head, the bicycle industry’s annual show ‘n’ tell called Interbike is just mere weeks away. Like in years past, I’ll be cruising the aisles of Interbike checking out what’s new and happening in cruisers and bigger-wheeled BMX bikes. Last year, some new complete bikes debuted that really caught my attention. 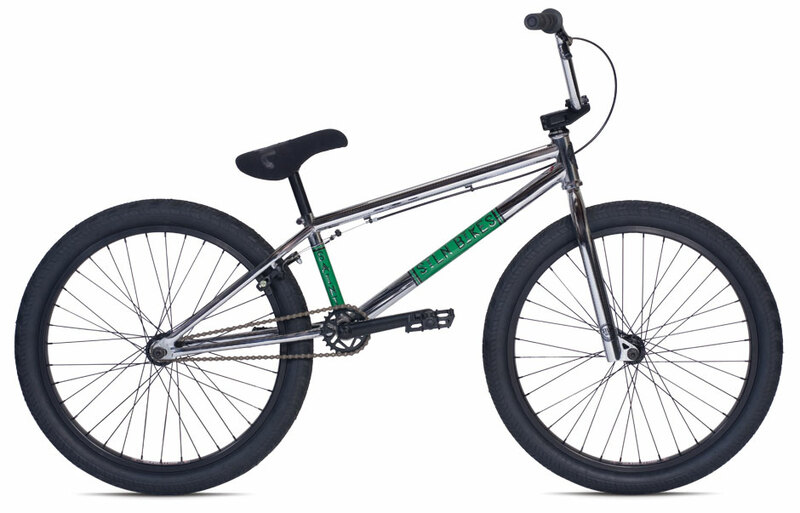 and the DK Elite Series Cruiser really stood out. But walking the tradeshow floor is only part of the comprehensive investigation this hard-working BMX journalist will be providing. In 2012, I went out and pounded the pavement to see if I could find the information that you just couldn’t find in the kiosks at the show. That desire to get the inside story took me to one of the pools on the Strip where Maxim magazine’s Hometown Hotties were holding court. It was there that I heard that the 2013 models would be bigger in the front and have tighter back ends. Who knew you would learn about chain-stay length at a Vegas Pool? Of course, it’s important to get the local perspective on things. And there is no better place to do that than at the annual 4130 Sin Series ride (scheduled to go down on the Friday of Interbike Week this year). 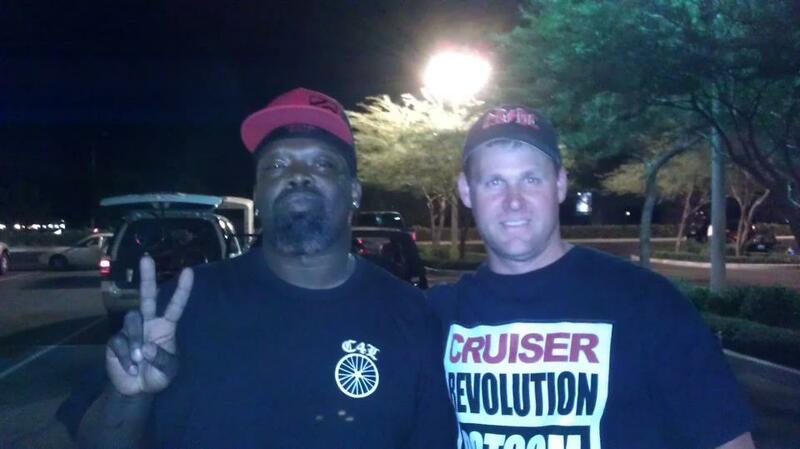 …and catching up with out-of-town visitors like Randy Franklin, this is the event that brings it all home. Even though I’m excited to see what the bike industry has cooked up for 2014, it’s important to remember that bike riding is still all about getting together with your friends and having fun…and that’s what the 4130 Sin Series ride is all about. Looking forward to some good times in Vegas. 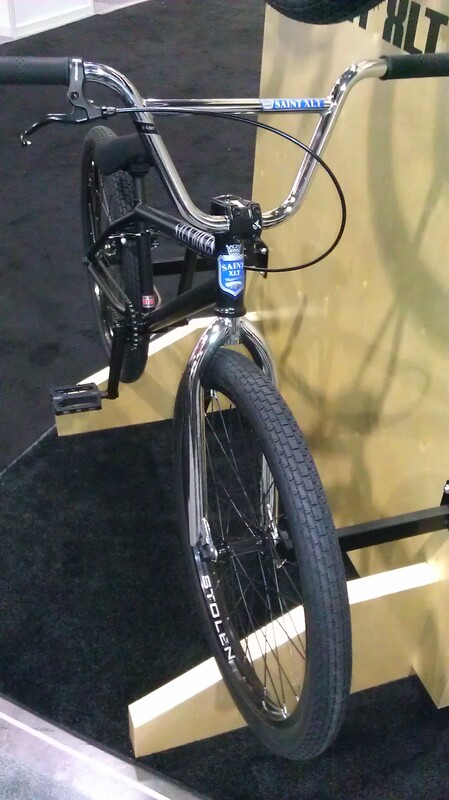 Stolen Bikes got our attention last year when they introduced the Stolen Saint 24 at Interbike. 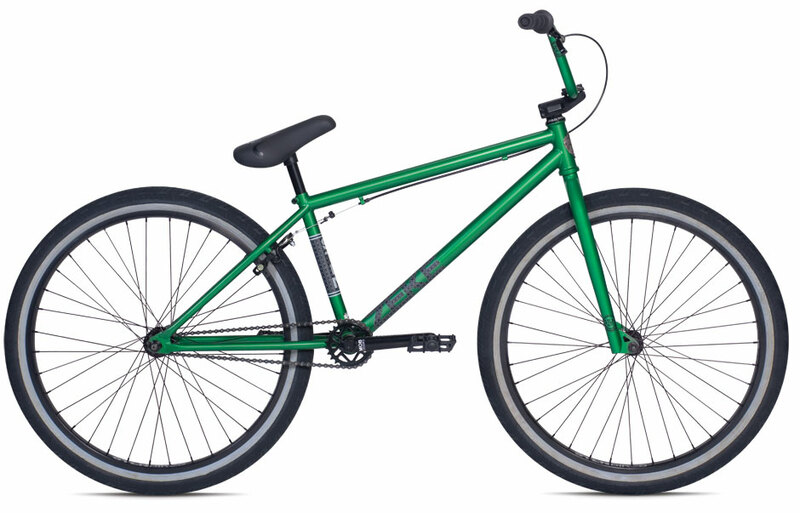 The Stolen Saint was a solid first effort: modern freestyle geometry, tough components (for a mid-level bike) and a tri-moly frame (which is common at this price point). 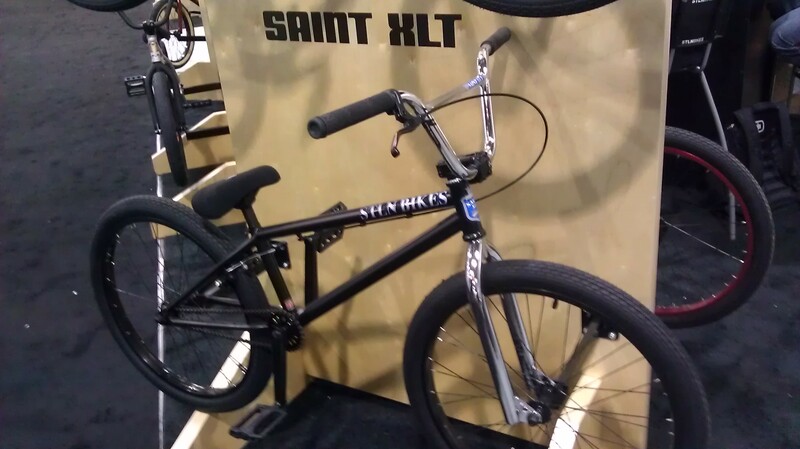 For 2013, Stolen has upped the ante a bit with the Saint XLT. On display at this year’s Interbike tradeshow, the Saint XLT showed that Stolen might just be serious about this 24″ game. Sharing the same geometry as last year’s Saint model, the Stolen gang have made this version’s frame and fork 100% cro-mo. And with a nod to the way that many people are running their bars today, Stolen has also outfitted the XLT with 8.25″ handlebars. I believe the headset and bottom bracket have also been updated to new sealed versions as well (but don’t quote me on that). Nice to see Stolen taking a great new 24″ option and making it even better! Should be in stores in the next month or so. Available in Black with Chrome (as shown above) and Matte Copper with Silver. Check it out if you get the chance.